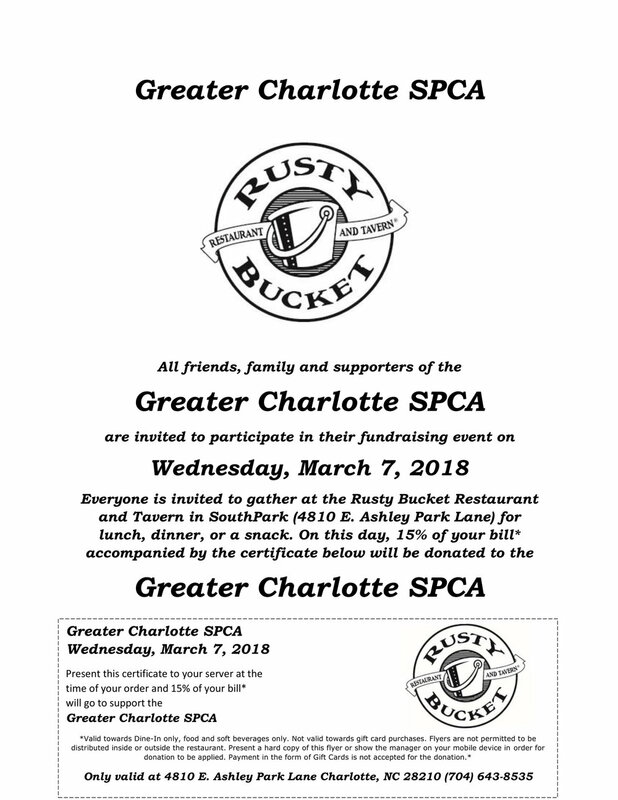 Join us on Wednesday, March 7th, at 11:00 AM at Rusty Bucket Restaurant and Tavern in the SouthPark area off Fairview Rd. Everyone is invited to gather at the Rusty Bucket Restaurant and Tavern in SouthPark for lunch, dinner, or a snack. On this day, 15% of your bill accompanied by the certificate below will be donated to the Greater Charlotte SPCA. Present this certificate to your server at the time of your order and 15% of your bill will go to support the Greater Charlotte SPCA. Valid towards Dine-In only, food and soft beverages only. Not valid towards gift card purchases. Flyers are not permitted to be distributed inside or outside the restaurant. Present a hard copy of this flyer or show the manager on your mobile device in order for the donation to be applied. Payment in the form of Gift Cards is not accepted for the donation.